Shodan is a search engine that lets the user find specific types of computers (routers, servers, etc.) connected to the internet using a variety of filters. Some have also described it as a search engine of service banners, which are meta-data the server sends back to the client. This can be information about the server software, what options the service supports, a welcome message or anything else that the client can find out before interacting with the server. Shodan collects data mostly on web servers at the moment (HTTP port 80), but there is also some data from FTP (21), SSH (22) Telnet (23), SNMP (161) and SIP (5060) services. It was launched in 2009 by computer programmer John Matherly, who, in 2003, conceived the idea of searching devices linked to the Internet. The name Shodan is a reference to SHODAN, a character from the System Shock video game series. SHODAN can be used to find dangerous systems on the Internet. It has been used to find the security flaws in TRENDnet security cameras, heating and security control systems, accessible databases and many other devices. 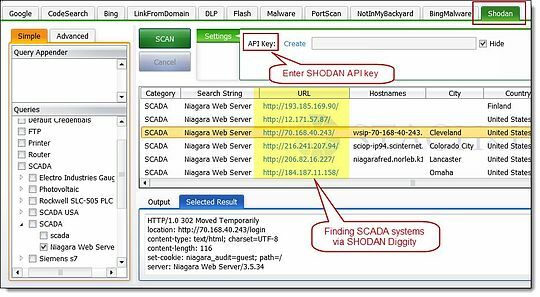 Bulk searching and processing of SHODAN queries can be performed using SHODAN Diggity (part of SearchDiggity, Bishop Fox’s free search engine attack tool suite). The free tool provides an easy-to-use scanning interface to the popular hacking search engine via the SHODAN API. SHODAN Diggity comes equipped with convenient list of 167 search queries ready in a pre-made dictionary file, known as the SHODAN Hacking Database (SHDB). This dictionary helps target various technologies including webcams, printers, VoIP devices, routers, toasters, switches, and even SCADA/Industrial Control Systems (ICS) to name just a few. Some free RSS alerts can be utilized to perform ongoing monitoring of SHODAN results for any new vulnerability exposures related to organizations. They are part of the free defensive tool suite of the Google Hacking Diggity Project, which form a type of intrusion detection system for search engine hacking (including results from SHODAN, Google, Bing, etc. ).